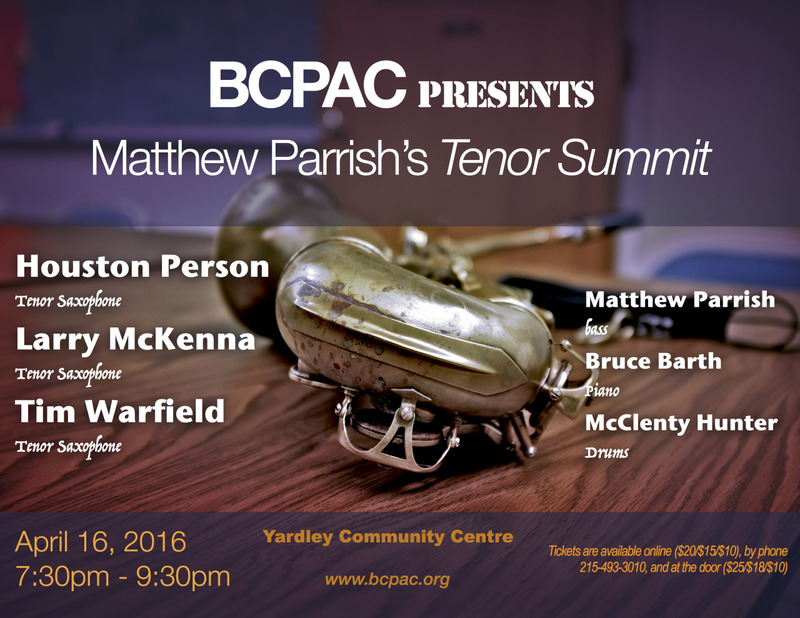 BCPAC PRESENTS: MATTHEW PARRISH'S TENOR SUMMIT SET TO WOW LOCAL AUDIENCES April 16 at Yardley Community Centre, 7:30 p.m. In a growing tradition of bringing you jazz excellence and excitement, local jazz acoustic bassist, Matthew Parrish, and Bucks County Performing Arts Center (BCPAC) have managed to get three stellar tenor saxophone players to the Yardley Community Centre stage (64 S. Main St., Yardley, PA 19067) on April 16, 2016, at 7:30pm. This season finale is not to be missed – and get tickets early as Matthew’s musical showcases are always packed. The interplay of tenor sax jazz greats Larry McKenna, Houston Person, and Tim Warfield will make this a once-in-a-lifetime summit. Round it out with Matthew’s bass skills, McClenty Hunter on drums, and Bruce Barth on piano and everyone from those new to jazz to the seasoned listeners will experience an unforgettable night. Houston Person is a master of his craft. He has deep performance roots in playing with Cedar Walton, Johnny Hammond, Ray Drummond, Lewis Nash, Ron Carter, and a long-time history of appearances with singer Etta Jones. This barely touches on his body of work, which also includes an extensive recording roster, with a series of albums for Muse, and a 2012 recording, ‘Naturally’, recorded at the famed Van Gelder Recording Studio. Larry McKenna’s impressive performance roster includes touring with band leader Woody Herman, and appearances with Clark Terry, John Faddis, Buddy DeFranco, Rosemary Clooney, Frank Sinatra, Tony Bennett, Johnny Mathis, Mel Torme, and Peter Nero & the Philly Pops. Larry brings his musical experience, which started at the age of fourteen, to a variety of devoted students, many of whom are now well-known professional musicians. In addition to a long recording history, Larry is also a prolific musical arranger. His arrangements have been played on Johnny Carson’s ‘The Tonight Show’, and in the movie ‘Birdy’, starring Nicholas Cage (which Larry also played in and appeared in). Tim Warfield, Jr., a native of York, Pennsylvania, got a big career break in 1990 when he was chosen to be a member of trumpeter and CBS/Sony recording artist Marlon Jordan’s Quintet. In 1991 he was selected to record Tough Young Tenors on the Island/Antilles label, listed as one of the top ten recordings of the year by the New York Times. Tim has done numerous television appearances, has a vast recording portfolio, and he has made numerous stage appearances with such names as Donald Byrd, Marcus Miller, James Williams, Christian McBride, The Harper Brothers, Dizzy Gillespie, Isaac Hayes, Shirley Scott, Jimmy Smith, Terell Stafford, Stefon Harris, The Newport Millennium All Stars, “Papa” John Defrancesco, Joey Defrancesco, Danilo Perez, and others. Tim is an avid jazz educator besides being a busy touring musician. Featured in February, 2016’s ‘Modern Drummer’ magazine, McClenty Hunter, also Manhattan-based, brings a beyond-his-years mastery of jazz drumming that locks in a tight rhythm section. McClenty currently tours with famed alto sax player, Kenny Garrett. As the musical ‘anchor’ of this special band and its organizer, Matthew Parrish, a Bucks County resident, continues to play jazz bass throughout the world. He has performed and recorded with many greats such as Al Grey, Harry ‘Sweets’ Edison, Clark Terry, Marian McPartland, Etta Jones, Houston Person, Paquito D’Rivera, Bobby Durham, Mickey Roker, Shirley Scott, Winton Marsalis, Regina Carter, Stefon Harris, Jackie Terrason, Orrin Evans, and Kenny Barron. Matthew also enjoys composing and arranging music. The performance is being sponsored by Hill Wallack LLP. There is a New Ticketing Policy for the 2015-16 Season! Advance Sales are $20 Adults/$15 Seniors/$10 Students. Tickets can be purchased online, at bcpac.org or by mailing a check to BCPAC, 1140 Edgewood Road, Yardley, Pa 19067 with a stamped self-addressed envelope. Tickets will be mailed if time allows, otherwise they will be held at the door. Tickets bought on concert night will be $25 Adults/$18 Seniors/$10 Students. Parking is ample on and around Main Street and behind the (now empty) Keller Williams Real Estate company next to the Community Centre. Come early or stay late to enjoy Yardley’s growing number of wonderful eateries. If you wish to join BCPAC’s mailing list or find out more about BCPAC you can call (215) 493-3010, or online at their website: www.bcpac.org. BCPAC is a registered non-profit organization based in Lower Makefield Township. Its mission is devoted to the creation of community through the arts.